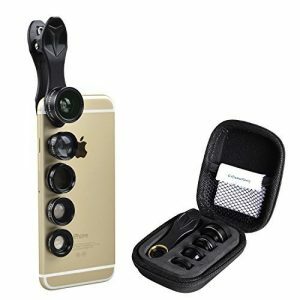 PHONE CLIP LENS FOR SMARTPHONE: 4 in 1 Lens Kit is a pocket-sized lens. 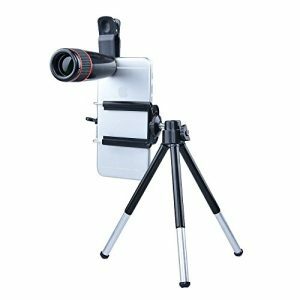 It is easy to carry because it contains a pouch, it can be attached with a clip and includes a phone tripod for stable use. 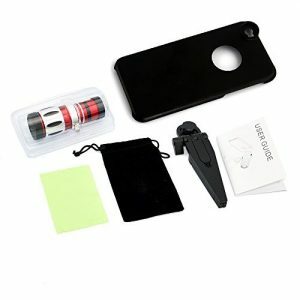 This kit is a lens for a smartphone(tablets) and is a universal phone clip lens that can enhance the image. 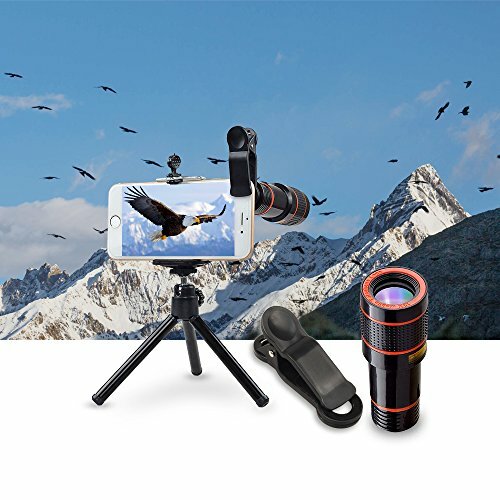 You can shoot your favorite images with four lenses designed to capture a wide range of images. 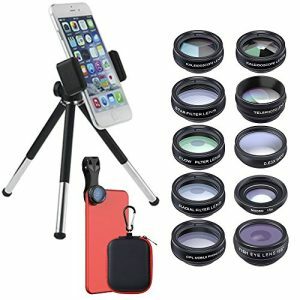 Take a variety of stunning pictures with the phone camera lens kit. 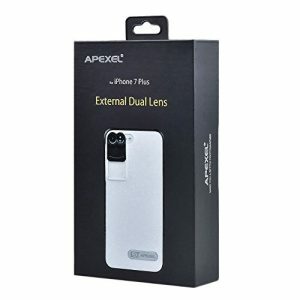 FISH EYE LENS: Because the visible range is as wide as 198 degrees, it is a lens with a rounded picture. 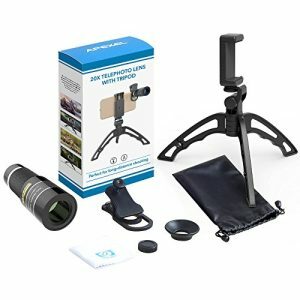 You can shoot more wide than ordinary wide-angle lens, and exaggerate a specific part with a large round, so you can take more interesting pictures when taking portraits. 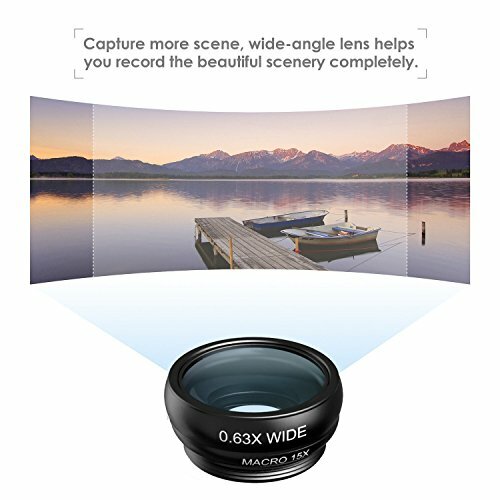 ▣ 0.63x wide angle lens : can shoot larger range of scenery. 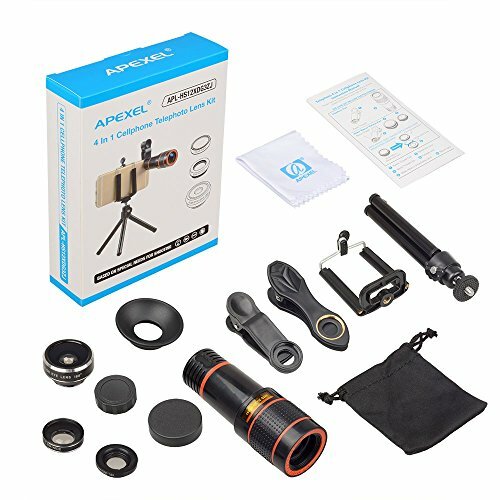 NOTE: It has to attached to macro lens to work properly. 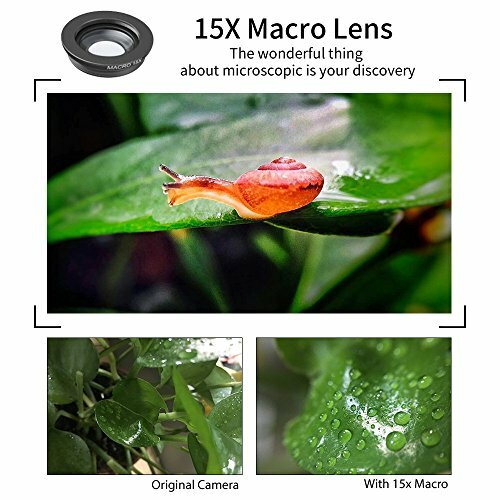 ▣ 15x Macro lens : can take clear photos of small objects. NOTE: Use a macro lens for photographing small things, you need get close to subjects. 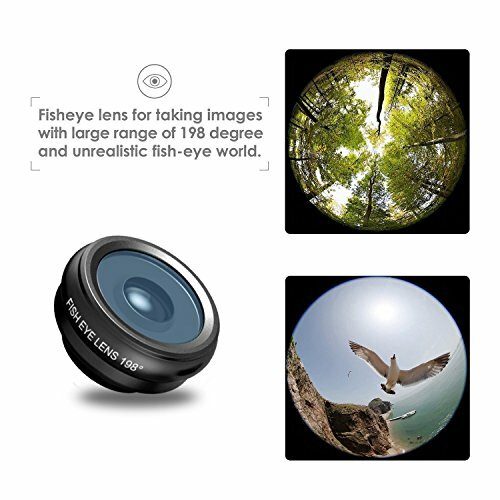 ▣ 198° Fisheye lens : 198 degree of the scene can be captured by Fisheye lens, which can let you enjoy a fantastic world. 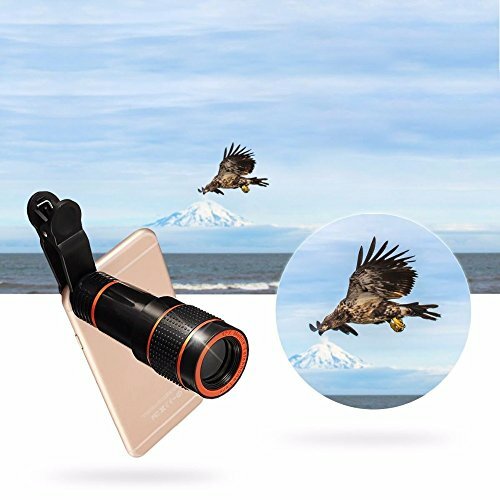 ▣ 12X Telescope Lens :Make you shot more distant scene enlarged photo, good for distant details and unapproachable subject. 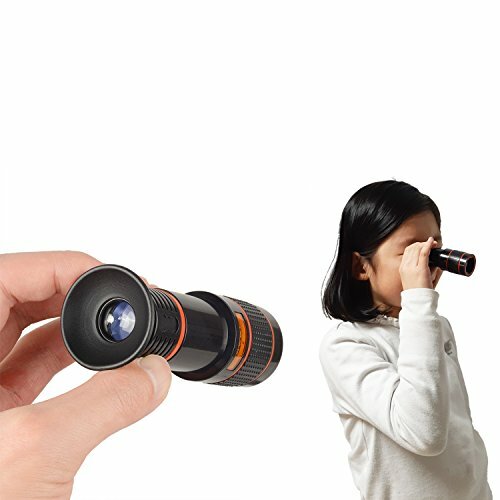 NOTE: Use it by attaching it to the telephoto lens. This makes it easier to view. 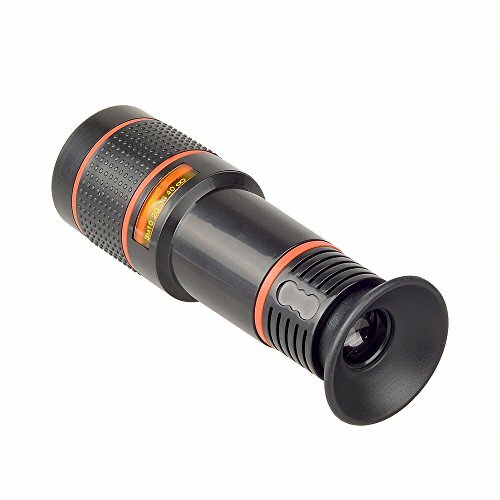 MACRO LENS: The Macro lens allows you to achieve shots that are extremely close to an object, great for taking shots of small items to view every last detail up close. 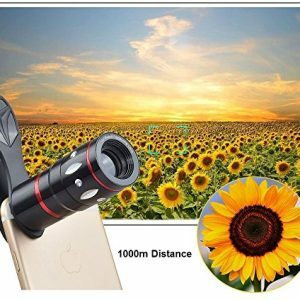 Keep a close-up view of your everyday accessories and flowers with a lens that allows you to shoot more clearly. 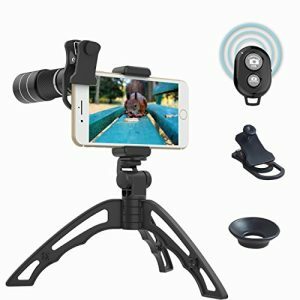 WIDE ANGLE LENS: Perfect for capturing more of the world around you, allowing you to take photos of landscapes and group photos far easier than ever. Take in the buildings in front of you and the wide scenery in your camera. You can get more extensive and stable results.